Sketching is a natural way for one person to convey their thoughts and intentions to another. 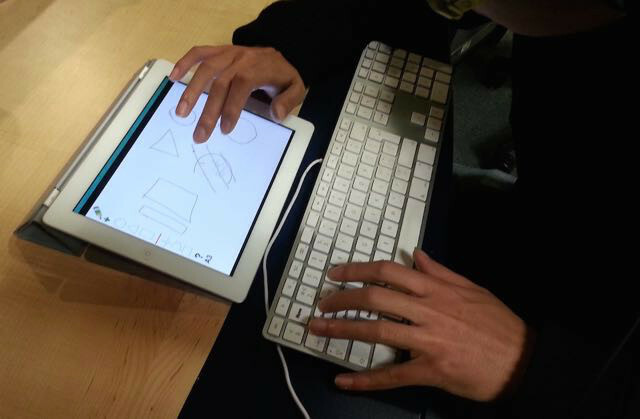 With the recent rise of tablet-based computing, we believe the use of sketching as a control and interaction paradigm would offer a new and innovative method of music creation. As an on going research project and a creativity support tool, Drawchestra is designed to extend novices' capability to make music. Whilst the overall research explores a rational cross-model mapping between sketches and sound attributes. New versions of the application are being developed in order to assess different mapping strategies. Diao, H., Zhou, Y., Harte, C., Bryan-Kinns, N. (2014).Sketch-Based Musical Composition and Performance. In Proceedings of New Interfaces for Musical Expression (NIME) 2014. London, UK.